A third baby has died in connection with China's spreading scandal over tainted milk formula and more than 6,200 infants have become sick, Health Minister Chen Zhu said Wednesday. His comments came as the major Chinese dairy Mengniu announced baby formula recall after the industrial chemical melamine found in product. The announcement did not say whether any of Mengniu's baby formula was exported. China's quality watchdog says that its inspectors have found melamine in milk powder made by more than 20 Chinese companies. The widening scandal is an embarrassing failure for China's product safety system, which was overhauled to restore consumer confidence and preserve export markets after a string of recalls and warnings abroad over tainted toothpaste, faulty tires and other goods. Chen told a news conference that of the 6,244 babies that have fallen ill, 158 were suffering from acute kidney failure. The latest death occurred in Zhejiang province, Chen said. The two earlier deaths had been reported in Gansu province. On Tuesday, the product safety scandal had expanded to include more foods, with state media reporting some formula produced by companies involved was exported. Inspectors found melamine "in 69 batches of milk powder manufactured by 22 companies," the General Administration of Quality Supervision, Inspection and Quarantine said in a statement posted late Tuesday on its Web site. 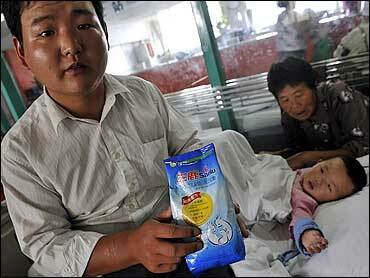 A nationwide inspection by the agency took test samples from 109 companies that produce baby milk powder in China. It said another 66 companies had already stopped production, but it did not give a reason. One company, Guangdong-based Yashili, exported its products to Bangladesh, Yemen and Myanmar, CCTV said, but added that initial testing of samples of the company's exports turned up no trace of melamine. In Hong Kong, food inspectors ordered a recall after melamine was found in an ice cream bar made by Shanghai Yili AB Foods. The amounts of the chemical found "would not pose major health effects from normal consumption of the bar, however, small children should not eat it," the Center for Food Safety said in a notice posted on its Web site. The company at the heart of the food scandal, Sanlu Group Co., has apologized for the tainted milk powder, which the Health Ministry says was spiked with melamine. The company says suppliers who sold the raw milk apparently added the chemical, normally used in plastics, to make the milk appear higher in protein. Zhang Zhenling, Sanlu's vice president, apologized Monday but did not explain why the company took so long to inform the public about the contamination despite receiving complaints as early as March and having tests confirm the presence of the chemical in early August. The company went public with the information after its New Zealand stakeholder told the New Zealand government, which then informed the Chinese government. "The serious safety accident of the Sanlu formula milk powder for infants has caused severe harm to many sickened babies and their families. We feel really sad about this," Zhang said, reading from a prepared statement. Sanlu's General Manager Tian Wenhua was fired and dismissed from the company's board of directors as a result of the scandal, Xinhua quoted Communist Party officials as saying in the northern city of Shijiazhuang, where the company is based. In total, four men have been arrested in relation to the tainted milk, spokesman Shi Guizhong with the Hebei Provincial Security Department was quoted as saying by the official Xinhua News Agency on Tuesday. The newly arrested dealers were only identified by their surnames as Ma, 40, and Zhao, 43. Earlier, police said they had arrested two brothers, surnamed Geng, who ran a milk collection center in Hebei province and are accused of watering down milk to increase volume then adding melamine, Xinhua said. They sold about three tons of contaminated milk a day, the report said. Shoddy and fake goods are common in China, and infants, hospital patients and others have been killed or injured by tainted or fake milk, medicines, liquor and other products. None of the milk powder was exported to Europe or the United States, although Sanlu is 43 percent owned by a New Zealand dairy farmers' cooperative, Fonterra. Fonterra, the world's biggest milk trader, says it urged Sanlu to recall the product as early as Aug. 2. Sanlu did not order a recall until last Thursday, after the New Zealand government took up the issue with China. Chinese officials have defended their response but blamed Sanlu Group for delays in warning the public. Officials say they were not alerted until last week.